Dr. Ali Sepehr explains how long swelling typically lasts following secondary nasal surgery, touching on the motivations for undergoing this procedure. Irvine, CA—Nose reshaping, medically referred to as rhinoplasty, was the second most popular cosmetic plastic surgery procedure in 2013, according to the American Society of Plastic Surgeons. 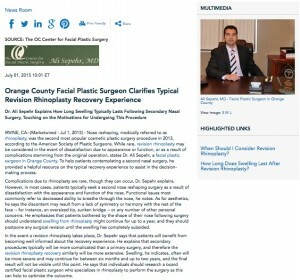 While rare, revision rhinoplasty may be considered in the event of dissatisfaction due to appearance or function, or as a result of complications stemming from the original operation, states Dr. Ali Sepehr, a facial plastic surgeon in Orange County. To help patients contemplating a second nasal surgery, he provided a helpful resource on the typical recovery experience to assist in the decision-making process. Complications due to rhinoplasty are rare, though they can occur, Dr. Sepehr explains. However, in most cases, patients typically seek a second nose reshaping surgery as a result of dissatisfaction with the appearance and function of the nose. Functional issues most commonly refer to decreased ability to breathe through the nose, he notes. As for aesthetics, he says the discontent may result from a lack of symmetry or harmony with the rest of the face–for instance, an oversized tip, sunken bridge–or any number of other personal concerns. He emphasizes that patients bothered by the shape of their nose following surgery should understand swelling from rhinoplasty might continue for up to a year, and they should postpone any surgical revision until the swelling has completely subsided. In the event a revision rhinoplasty takes place, Dr. Sepehr says that patients will benefit from becoming well informed about the recovery experience. He explains that secondary procedures typically will be more complicated than a primary surgery, and therefore the revision rhinoplasty recovery similarly will be more extensive. Swelling, he indicates, often will be more severe and may continue for between six months and up to two years, and the final result will not be visible until this point. He says that individuals should research a board certified facial plastic surgeon who specializes in rhinoplasty to perform the surgery as this can help to optimize the outcome. Ultimately, Dr. Sepehr believes that while the circumstances that lead to needing a revision rhinoplasty may be unfortunate, this procedure can help to achieve the aesthetic and functional benefits that patients originally desired. The most important part of this process, he indicates, is finding a physician with abundant experience who understands the cosmetic goals and anatomic needs of the individual. Dr. Sepehr is a board certified facial plastic surgeon and a Fellow of the University of Toronto School of Medicine in Otolaryngology – Head and Neck Surgery. He received his undergraduate and medical degree from the University of California, Los Angeles, and completed additional training in Head and Neck Surgery and Facial and Reconstructive Surgery at the University of California, Irvine. The recipient of numerous awards, he has earned the Reuther Kris Conrad Merit Award, and he has been recognized as one of America’s Top Physicians. Dr. Sepehr is available for interview upon request.